So the cat allergies are getting the best of me. I’ve been waking up every morning in a sneezing fit. Of course this is before I’m ready to get up, say 4 or 5am. Eric sleeps through the whole thing, I don’t understand. We’ve been keeping our house extra clean, banning her from the bedroom, bathing her once a week and wiping her down everyday. I’ve never lived with a cat before, or a cat lover. So I’m working on doing everything I can to keep my sanity while also enjoying precious Pearl. She really is a sweetie, I’m just trying to figure out how I’m going to stay healthy through all of this. So today I’m getting an HEPA air purifier for our house. I might need a few! I’m not about to dose myself up with antihistamines or allergy shots for the rest of forever. Over the next few weeks I’m going to really focus on getting my immune system strong. Do you have pet allergies? Any tips to help with dealing with cat allergies? 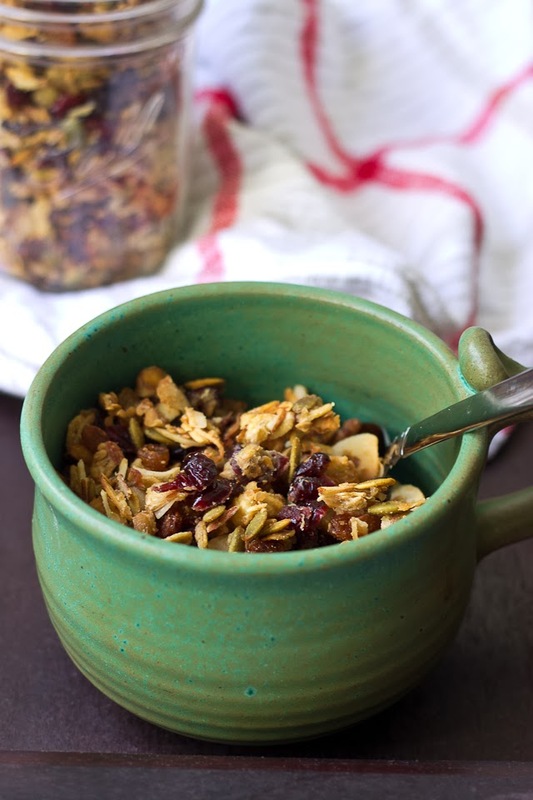 In large bowl combine quinoa, nuts, seeds, kamut, dried fruit, coconut and spices together and mix until incorporated. In small bowl stir together coconut oil, vanilla, and agave nectar. Place coconut oil mixture in microwave for 10 seconds until melted; then pour over nut and oats and mix until fully coated. 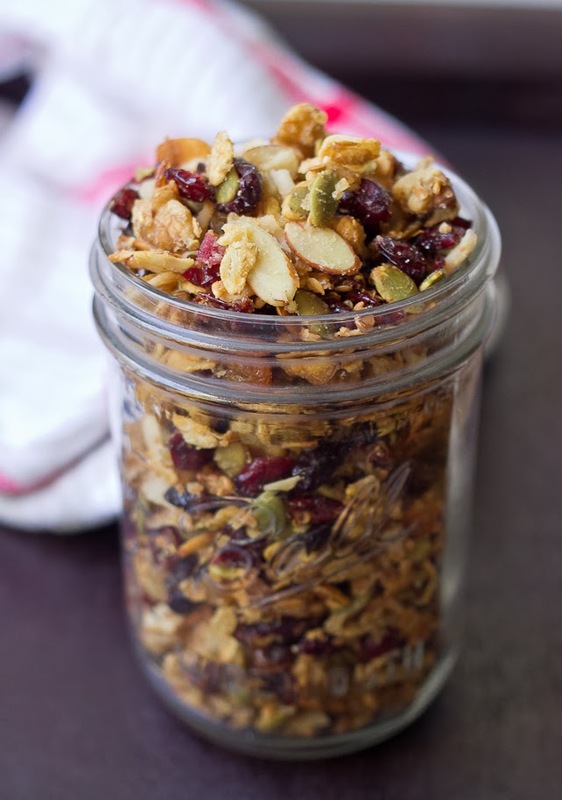 Pour granola on a rimmed baking sheet and bake for 30 minutes until granola is golden. 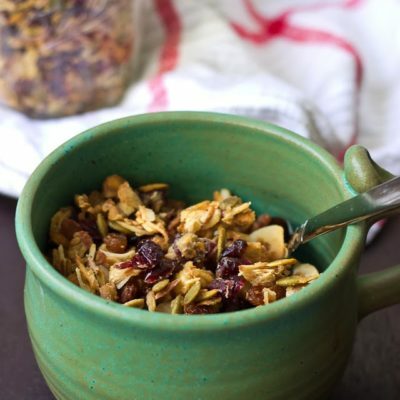 I have this yummy granola in the oven right now! Do you have any idea on the serving sizes and nutritional info? I’m plugging the ingredients into My Fitness Pal and was wondering what a good serving size is. It is already smelling so good. I think I may have goofed and bought milled flax seed instead of whole and I’m trying with coconut oil, cannot wait to try it! hey! I want some… I love this stuff! yeah I haven’t plugged it into myfitnesspal but that is what I use! I’m sure the milled flax will be just fine… plus you’ll absorb more nutrition with the milled— I just like the crunch of whole flax 🙂 I’d say a normal serving of granola is about 200 calories, usually about 1/3 to 1/2 cup.. Let me know what you learn, if you don’t mind? Oh you read my mind!!! Ok I’m plugging in right now, you know you are my new hero! I’ve been telling all my friends at the gym about your awesome blog!!!! P.s. I hope I don’t seem like I’m stalking your recipes, lol- I’m a bit of a foodie (and a little bit of a runner too) you rock!!! OMG! Not at all! I’m thrilled you are enjoying the recipes 🙂 Thanks so much for sharing your comments and for telling your friends! Ok this is pretty much the BEST thing I have tasted Kristina!!!! I love coconut so much and when I made your coconut chicken recipe the other night, that was the first time I had gotten the unsweetened desiccated coconut chips and I really didn’t know what to expect. I loved how you still get plenty of the coconut flavor without it being overly sweet. 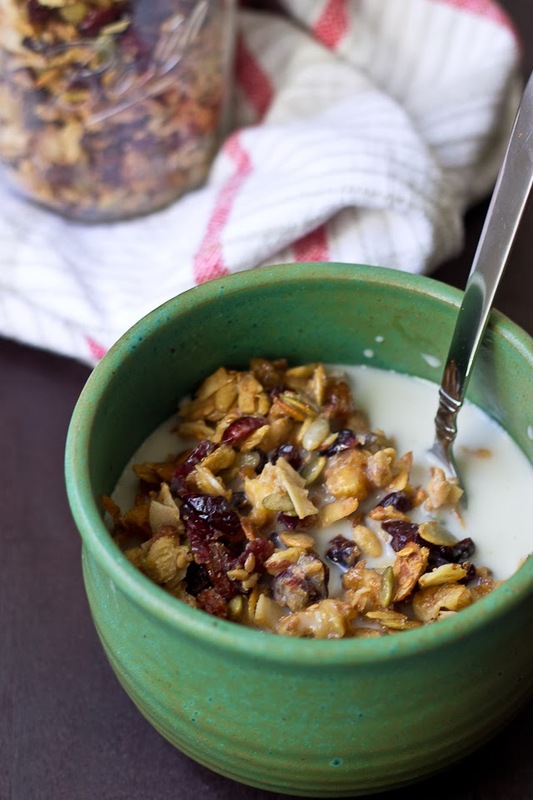 This granola is perfection, pure perfection!!! Nom nom nom- thank you thank you, thank you. I’m blushing! Really really thrilled you love the recipes! I didn’t realize how much I loved coconut until this recipe either– I think baking it might bring out the flavor. Thanks for sharing the info. I’m guessing maybe 1/2 cup servings, to get close to 12 servings? I’ll need to remake to measure the total yield… however if you can stretch it to 18 servings it would be 240 calories per serving. this looks delicious, must try it some time! I've never cooked with kamut before, but using new to me whole-grains is on my list of health goals for 2014, so this seems like a good place to start. I think my daughters may gobble this up way too fast. Ugh, with the pet allergies. I hope the hepa filter works. This is my first go around using it too! It's works nicely in place of oats here and also added ground kamut to bean burgers.. I don't have any pet allergies but I suffer from seasonal ones and right now, I feel like I have lost all feeling in my eyes and nose. I feel your pain but I don't have any suggestions 🙂 Neti pots are fabulous! 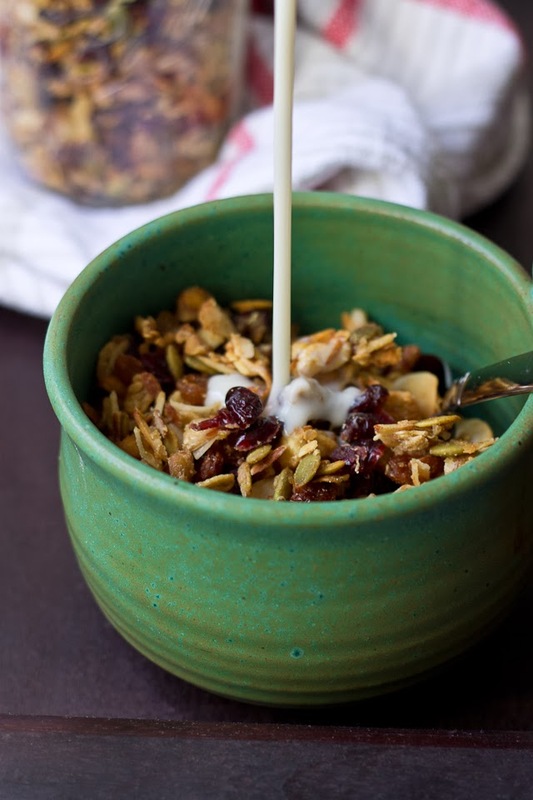 This coconut quinoa granola looks delicious, I need to start making more granola with quinoa. Seriously the air purifier we got is amazing! It’s helping me so much. I wonder if that could help seasonal allergies? and although we don't do this any more- after really snuggling with the cat he would wash his hands and change shirts. So sorry you're going through that! Thank you for your tips Carlene! It’s so encouraging that your husband is less allergic now.. there’s hope! We purchased an air purifier— and omg! I carry that think around with me wherever I go. And leave it in her room when we are gone! It’s such a breath of fresh air because I can actually breath out of my nose again! Cat allergies are the worst! When my last roommate had a cat, I kept a HEPA filter running in my room almost all the time. I hope all of your defenses work for you! 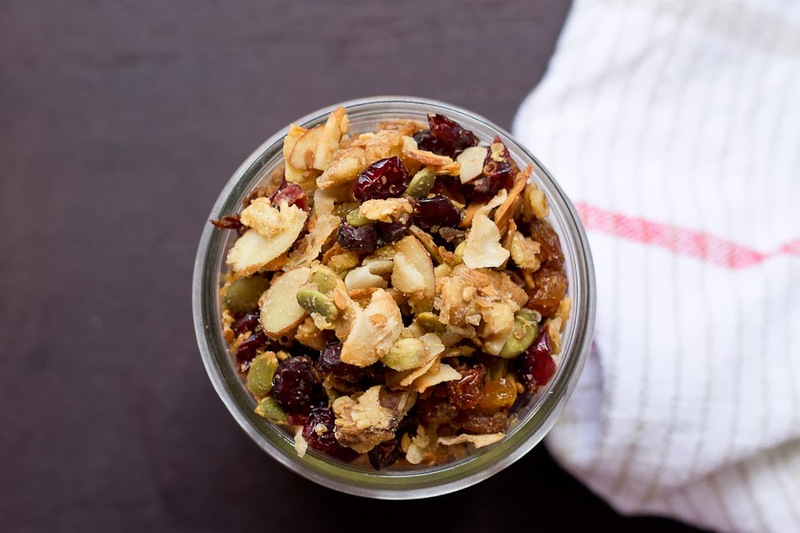 🙂 This granola looks delicious! Love the idea of quinoa and I can devour anything coconut. And these photos are gorgeous! Beautiful. Pinned! Thanks Erin for your comments and pinning!! The cooked quinoa gives is a nice chewy flavor..I’ve used uncooked before but it makes it a little too crunchy! We got a air filter and I’m so surprised at how much it’s helping me!